Our product range includes a wide range of ss 321 fasteners, ss 304l fassteners, ss 316l fasteners and ss 310 fasteners. Mass-produced by using graded alloy, these SS 321 Fastenersare widely used while joining two products as on. ... The presented products are obtainable in a number of sizes and other allied specifications. Buy SS 321 / SS 321H Fasteners at cost-effective price from us. 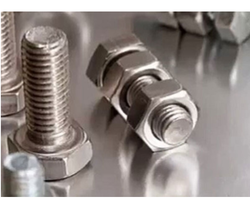 ASHAPURA STEEL AND ALLOYS is one of the known exporting house and distributor of Stainless Steel 304L Fasteners (Bolts / Nuts), which is considered resistant to potable water with chlorides at ambient temperatures. Stainless Steel 304L Hex Head Bolts is used for a variety of household and industrial applications such as screws, machinery parts, car headers, and food – handling equipment. These Stainless Steel 304L Hex Head Nuts is also used in the architectural field for exterior accents such as water and fire features. ASHAPURA STEEL AND ALLOYS is a most acclaimed Stainless Steel 316L Fasteners manufacturer, exporter & suppliers in India. Whether you are looking for manufacturers of collated screws, threaded fasteners, and blind fasteners of every type, Jignesh is the premier source for you. Recognized Bolting Specialist in ASIA, Africa & Middle East. Our Stainless Steel 316L Fasteners are widely used in number of industries such as aerospace, defense, automotive, petrochemical, waste processing, marine and pharmaceutical sectors. Buy custom Stainless Steel 316L Fastenerscreated with SS 316L in shortest delivery time. Our Stainless Steel 310 Fasteners are widely used in a number of industries such as aerospace, defense, automotive, petrochemical, waste processing, marine and pharmaceutical sectors. Buy custom Stainless Steel 310 Fasteners created with SS 310 in shortest delivery time.